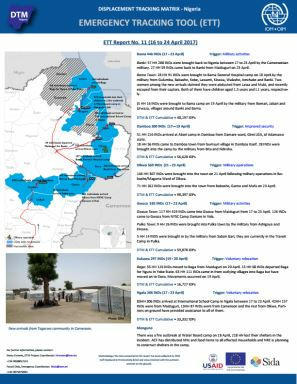 This document contains all Yobe site profiles for the round 16 data collection period. 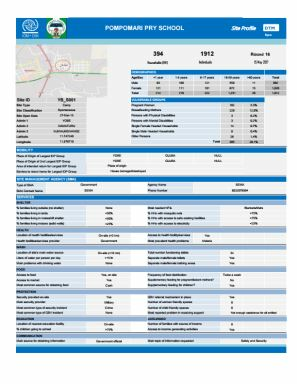 The list of sites assessed contains information on site number, site ID, site name, state, local government area (LGA), ward name, number of households and number of inviduals. 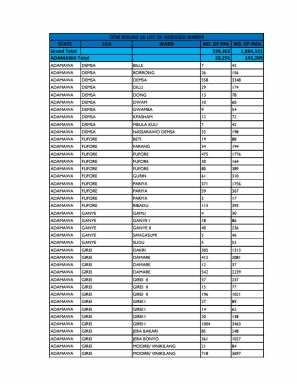 The list of assessed wards includes details with regards to state, local government area (LGA), ward, number of households and number of indiviudals. 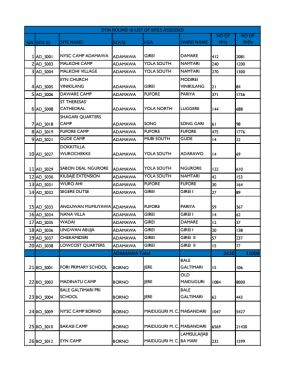 This document contains all Taraba site profiles for round 16. 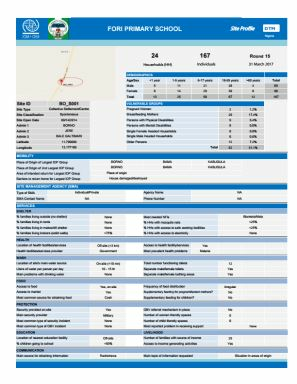 This document contains the the second half of Borno site profiles for round 16. 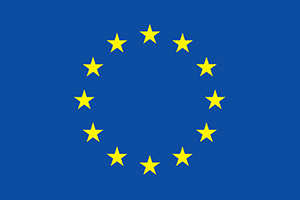 DTM has identified a total of 1,234,894 individuals returning to their respective homes of which 94,584 (7.7%) individuals are from Cameron, Chad and Niger Republic. 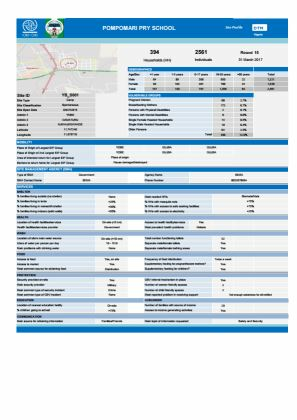 The dashboard contains a map displaying the concentration of returnees by area. 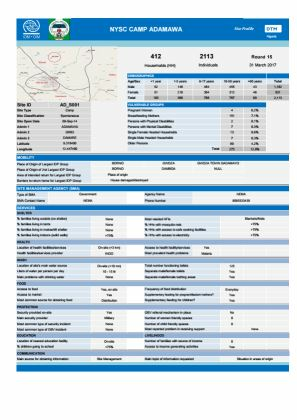 On 27 May 2017, IOM carried out an assessment to ascertain the level of damage sustained in camps and camp-like settings due to the storm on the previous day. 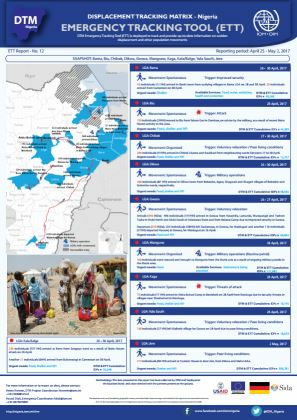 DTM Emergency Tracking Tool (ETT) was deployed to track and provide up-to-date information on sudden displacement and other population movements in: Borno (Bama, Chibok, Damboa, Dikwa, Gwoza, Kala Balge, Kukawa, Kwayar Kursar, Monguno, Ngala) and Adamawa (Mubi South). 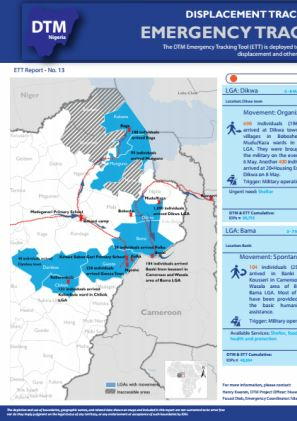 Included in this Emergency Tracking Tool (ETT) report are Bama, Kala-Bage, Gwoza. Chibok and Monguno. 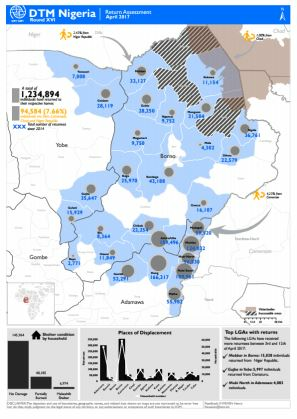 DTM recorded 42,902 IDPs in Bama, 35,706 in Kala-Balge, 60,836 in Gwoza, 12,950 in Chibok, and 1212,823 IDPs in Monguno (cumulative numbers). 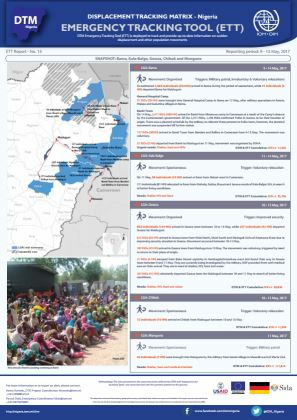 The DTM Emergency Tracking Tool was deployed to track and provide up to date information on sudden displacement and other population movements in: Bama, Chibok, Damboa, Dikwa, Gwoza, Kukawa and Monguno. Included in this Emergency Tracking Tool (ETT) snapshot are Bama, Biu, Chibok, Dikwa, Gwoza, Monguno, Kaga, Kala/Balge, Yola South, Jere. 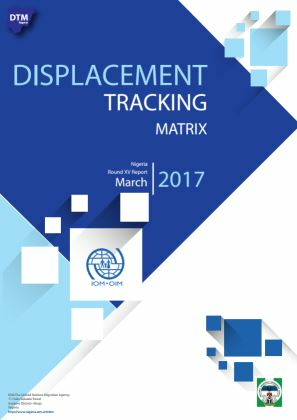 This snapshot contains Emergency Tracking data on Bama, Chibok, Dikwa, Gwoza, Kukawa, Damboa, Ngala, Kala Balge, and Maiduguri M. C.
DTM has identified 1,884,331 displaced individuals. 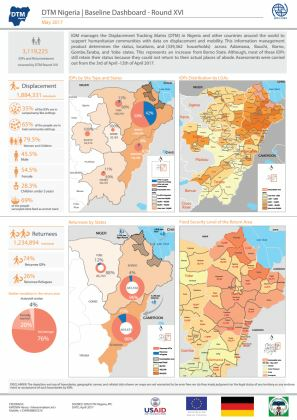 35% of IDPs dwell in camps or camp-like settings. 65% of all individuals are in host community settings. 79.5% are women and children. 28.3% are children under five years. 69% of people surveyed cited food as an unmet need. 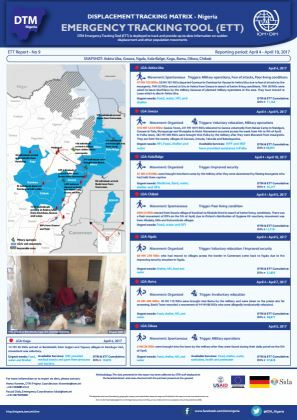 Included in this Emergency Tracking Tool (ETT) snapshot are Gwoza, Ngala, Kala-Balge, Chibok, Damboa and Askira/ Uba. 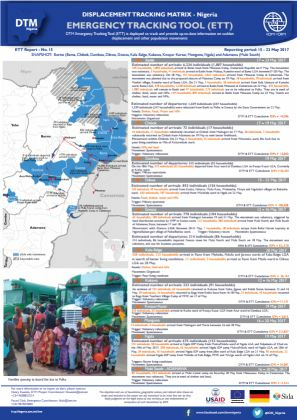 1,119 displaced individuals were recorded in Gwoza and, respectively, 133 in Ngala, 144 in Kala/ Balge, 874 in Bama, 143 in Askira Uba, 77 in Damboa and 33 in Chibok. 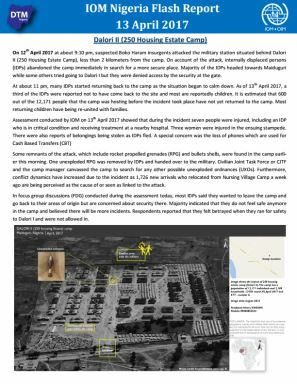 On 12 April 2017 at about 9:10 pm, suspected Boko Haram insurgents attacked the military station situated behind Dalori II (250 Housing Estate Camp), less than 2 kilometers from the camp. 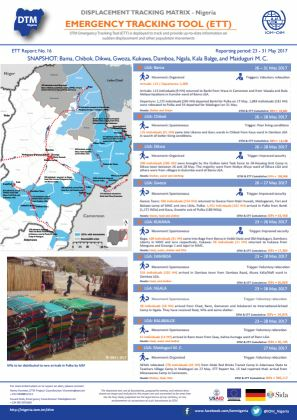 The DTM Emergency Tracking Tool (ETT) was deployed to track and provide up-to-date information on sudden displacement and other population movements in Askira Uba, Gwoza, Ngala, Kala-Balge, Kaga, Bama, Dikwa and Chibok. 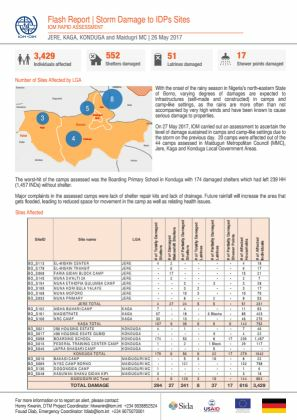 Included in this Emergency Tracking Tool (ETT) snapshot are Bama, Chibok, Damboa, Dikwa, Gwoza, Kala/Balge, Ngala and Monguno. 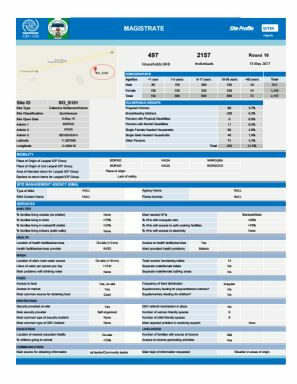 1,397 Individuals (357 households (HH)) arrived at Camps in Bama. 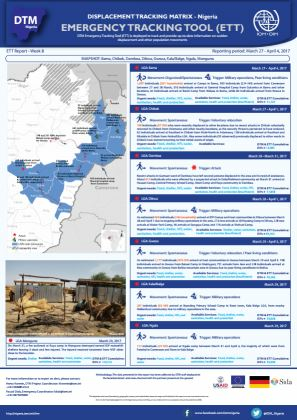 The report covers the period of 15 February to 31 March 2017 and includes six most-a­ffected states of Adamawa, Bauchi, Borno, Gombe, Taraba and Yobe. This is a compilation of all Round 15 Yobe site profiles. 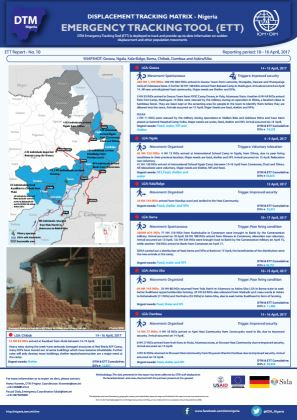 This is a compilation of all round 15 Taraba site profiles. This is a compilation of all Round 15 Borno Site profiles. This is a compilation of all site profiles in Adamawa identified in Round 15 assessments. 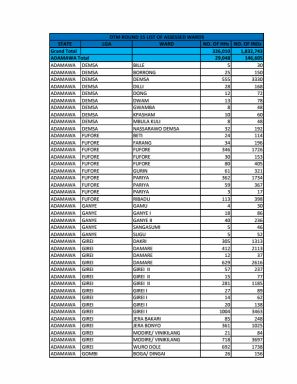 This is a list of all round 15 wards including state, local government area (LGA), ward and the number of households/ individuals.